Three years ago there was an event in my hometown that knitted the community together, literally. As part of the Flock to Ossett celebrations, the centre of the small town was yarn-stormed into a woolly wonderland by the town's knitters and crocheters. Unfortunately I couldn't make much of a contribution because I couldn't knit more than a few wobbly rows, knitting being a half remembered skill barely picked up in childhood. As the daughter of a confirmed knitter, I was the rebel who didn't. Not that I let it get to me. Not at all. Not me. It might have taken me three years to find the courage to pick up the knitting needles without hideous flashbacks to the scorn of that pub backroom, but I think I've finally got to grips with the woolly arts. Over the past month, I've taught myself (via the marvellous medium of the world wide web) how to knit AND crochet. Or more accurately taught myself how to cast on, knit a neat(ish) square of wool and, this is an important bit, cast off again without it all unravelling. 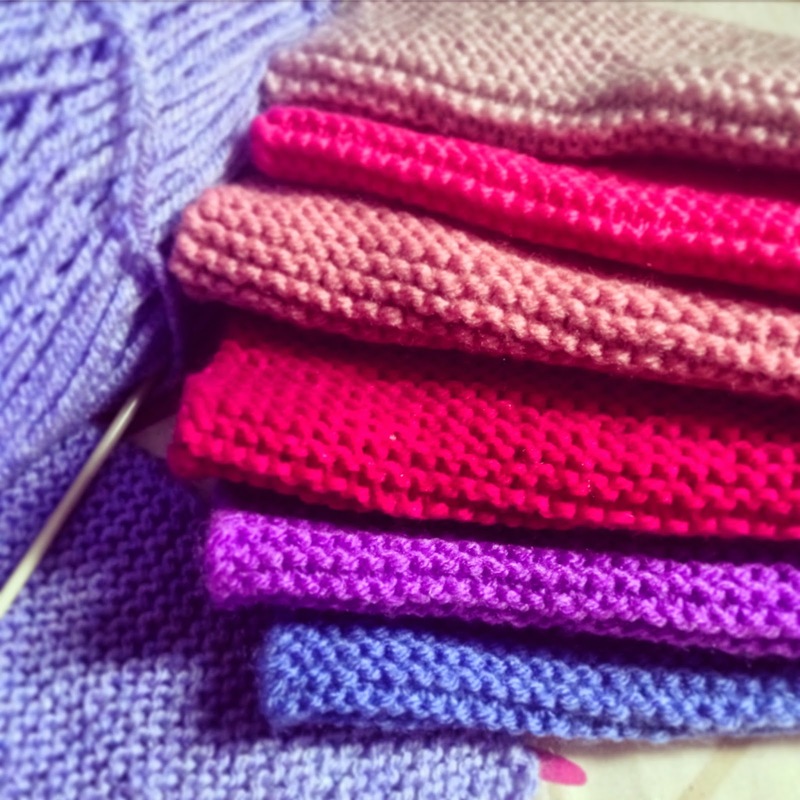 I am currently accumulating a small pile of squares which I intend to turn into a blanket at some point in the future, though that could be anytime between now and when I die. I'm still incapable of thinking of knitting anything more exotic or useful beyond a square a wool, but in time I might tackle knitting a scarf. A scarf is just an extra long square, how hard could it be? Crochet has always looked even more arcane than knitting to me; a mysterious flurry of twisting, turning and knotting wool while waving a small stick. But I had a go anyway. Mainly because I was assured that it was easier to crochet than knit and I'd already cracked that knitting thing, obvs. 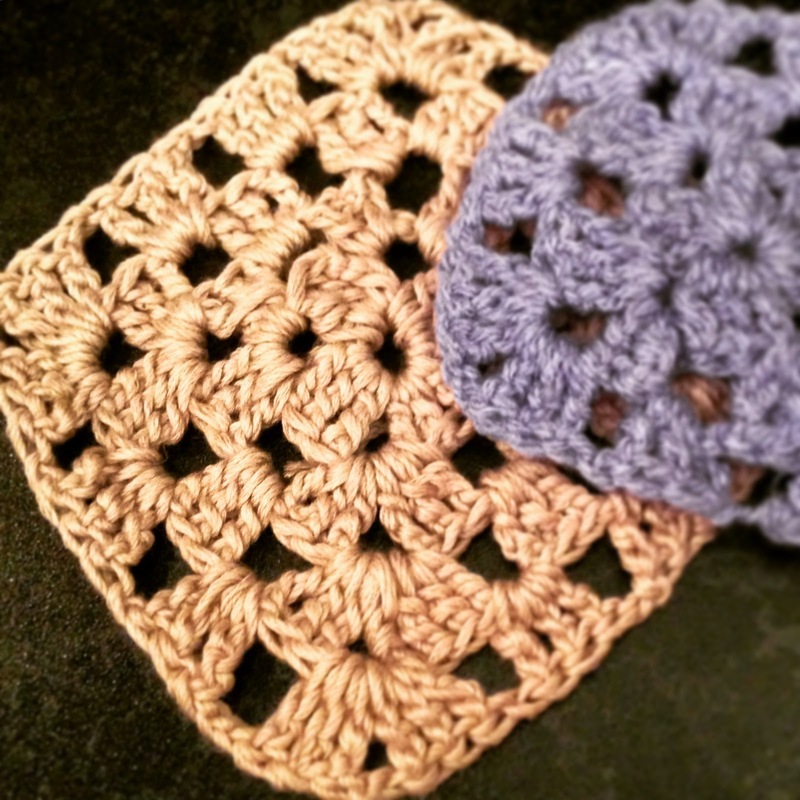 It took a tour through the free crochet tutorials on Little Tin Bird's blog but I managed to twist and turn some wool into something approximating a granny square at my first attempt. 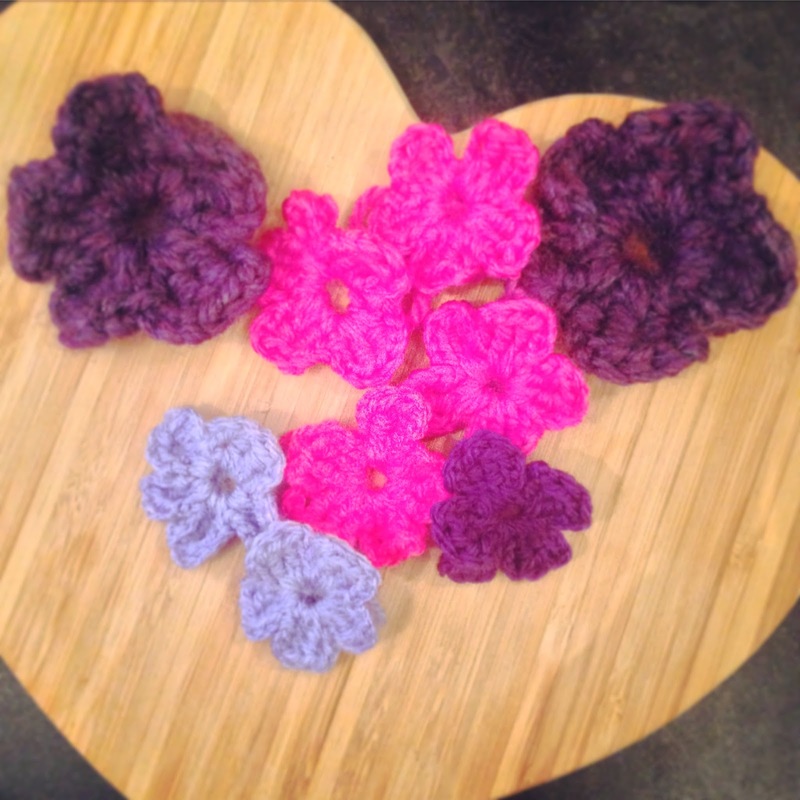 Then,, unexpectedly I unearthed a hitherto undiscovered ability to make crochet flowers, so I did, and I am. They also manage to look like the work of someone who knows what they're doing with a crochet hook, which I most certainly don't. Now almost four weeks to the day since I first approached a ball of wool with serious intent, I have created an actual thing. Not yet a blanket, or a scarf, or, sadly, a granny, but a Thing That I Have Made. Alright. 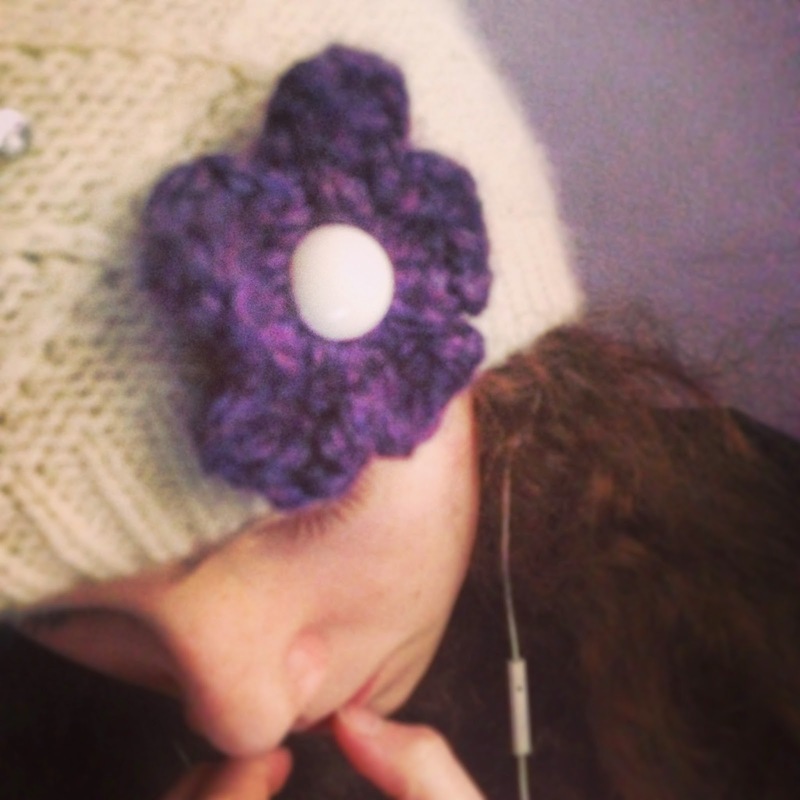 so I took an pre-existing woolly hat, put a button on it and then buttoned a crocheted flower on to that. But it was the crocheted flower that I made with my own two hands so I think it counts (probably). Child3 being remarkably impressed (sort of) with her new (sort of) hat.